The 2012 Leaping Trout Project is a project to help fund the efforts of The Ashokan Pepacton Watershed Chapter of Trout Unlimited. 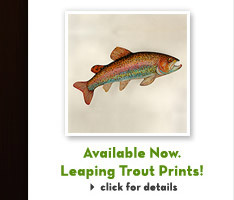 35 trout were displayed locally at public venues throughout the Catskill region for the 2012 Summer season and are now on exhibition at The Arts Upstairs Gallery in Phoenicia, NY. Online bidding ends Friday, December 7th at midnight. Highest bids will be transferred to the gallery before opening hours on Saturday, December 8th and will become the opening bids. All bidding after December 7th must occur in-person at the Arts Upsatirs in Phoenicia. Sorry, the gallery cannot accommodate phone bids during the live auction. Not sure if you're the high bidder? Take a look at the artist's page. The initials of the highest bidder will be displayed to the right of the current bid.. Bids will be updated on a daily basis. In some cases, more than one individual may bid on the same trout in a given day. Highest bid will be taken. In the event that two bidders bid the same amount on the same trout, first bid in will be taken. No buyer's premiums or commissions will be added to the hammer price. Please view the work online or in person and help support the conservation efforts of APWCTU.